Less power use and meat-eating, more trees and public transit: What you need to know about Pittsburgh’s new climate plan. A baby born in Pittsburgh in 2017 will live in a very different city by the time she heads off to middle school in 2030, if a new city climate action plan bears out. Life in the city will change, including how efficient the child’s home is, how she gets to school (ideally, an electric bus), possibly even how much meat she eats. Although the city’s plan has been in the works for years, its importance has increased after President Donald Trump announced that he was pulling the United States out of the Paris Climate Agreement and said he was elected to represent the citizens of Pittsburgh not Paris. Mayor Bill Peduto criticized Trump for pitting Pittsburgh in opposition to progressive climate policy. The plan, released Sept. 28, “makes it so that we are committed to the Paris agreement and then some,” Peduto said at a press conference touting the plan on Wednesday. 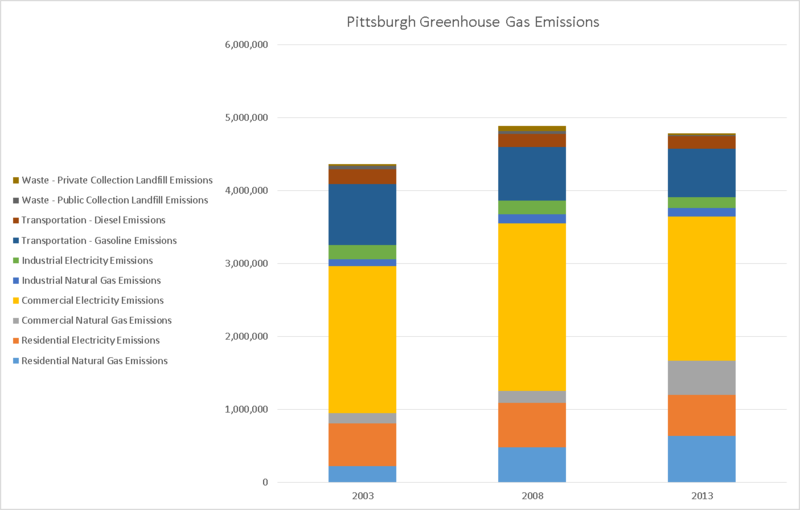 What is Pittsburgh’s climate action plan? Last week, the city released its third climate action plan. It outlines how dramatically the city will have to change to meet its goal to reduce greenhouse gases: 20 percent by 2023, 50 percent by 2030 and 80 percent by 2050. Although similar plans were created in 2008 and 2012, this is the first time the city rather than environmental nonprofits have led the effort. 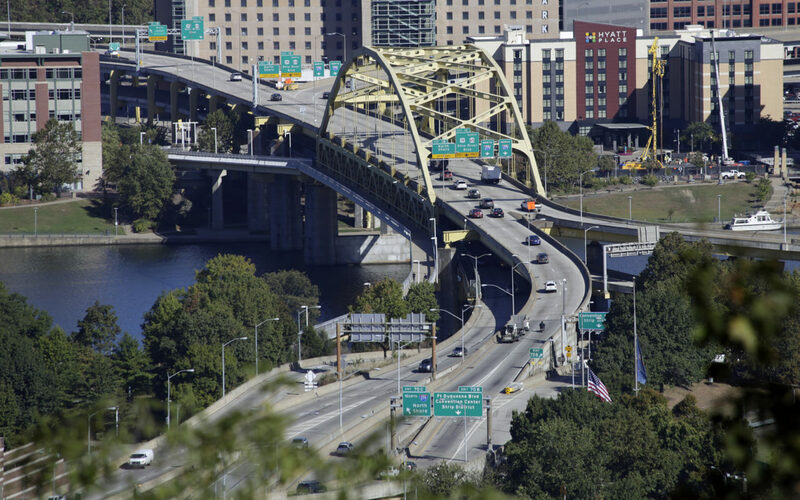 “It is clear that Pittsburgh needs to take more ambitious action,” the latest plan states. What will have to change? By 2030, if the plan is successful, Pittsburghers and Pittsburgh businesses will use half as much water and electricity and eat half as much meat. They will throw away 90 percent less food and flush half as much wastewater. And 90 percent of the city's trash will no longer end up in a dump. Commuters will take twice as many buses and trains, and every one of those city buses will be electric. People will drive half as many miles and half as many people will drive alone to work. And, on their way to work, people will see about 50 percent more trees and every new building they pass will be a green building. When the first climate action plan was created in 2008, these goals were a generation away. But the current plan is calling for more change at a faster pace. Why is Pittsburgh doing this? If cities and countries across the world don’t meet their targets set by the Paris Climate Agreement, Pittsburgh’s climate could feel like Alabama’s as soon as 2070, according to climate scientists, and the effects of climate change across the globe are predicted to be massive and sweeping. Cities like Pittsburgh are taking the lead in part because less is being done at the federal level. On Wednesday, the mayor’s office talked about how Pittsburgh was being invited by the United Nations to the next climate conferences because of the vision embedded in this plan. “We are also starting to share this with other cities because of the technical acumen we’ve been able to develop,” said Grant Ervin, the city’s chief resilience officer who spearheaded the creation of the plan. Not yet. Although the city’s total emissions fell by 2 percent between 2008 and 2013, they’ve increased overall since 2003 (the year the city is using as a benchmark to measure its progress). So while some individual programs have been successful, such as switching over to more energy-efficient light bulbs in parking garages, overall emissions are almost 10 percent above their levels in 2003. The increase in emissions from natural gas probably isn’t as large as it seems, according to the report, because the city has improved how it collects data, particularly on gas leaks. But there are some other indicators that the city hasn’t made the kind of progress its earlier plans called for: The percentage of commuters taking public transportation decreased and the number of people driving alone in their cars increased between 2010 and 2014. So why are some environmental groups excited? Although the city’s first two plans didn’t lower emissions from the 2003 benchmark, they did promote some of the infrastructure that has made this new, more ambitious plan possible. For instance, the original plan in 2008 called for at least one city employee to be devoted to this work full time and now there are four full-time employees whose responsibilities include advancing the plan’s initiatives. 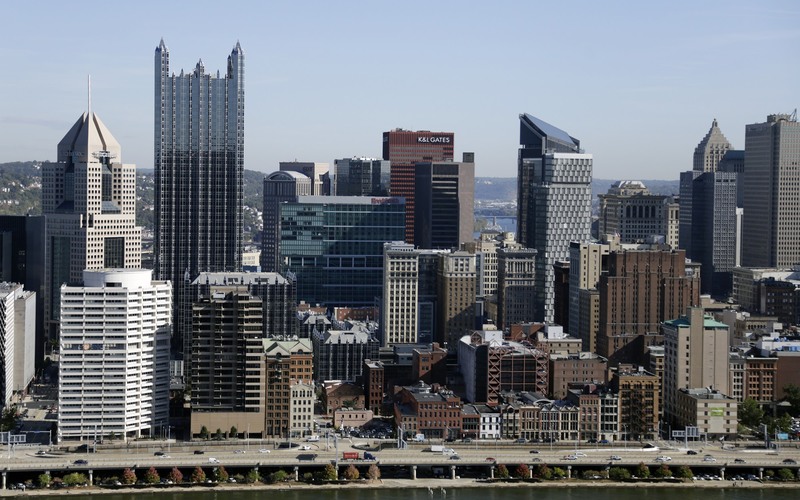 The first two plans also helped lead to some of the city’s biggest successes, such as the Pittsburgh 2030 District, which has partnered with 491 buildings to reduce emissions in Downtown and in Oakland, according to Lindsay Baxter at the Pennsylvania Environmental Council, who wrote the first plan and helped edit the second. Many of the city’s strategies, such as identifying gas leaks and fixing them, should lead to reductions, said Neil Donahue, a chemistry and public policy professor at Carnegie Mellon University, whose research has focused on climate change and who contributed ideas to the city’s plan. But not everything in the plan is narrowly focused on reducing emissions. 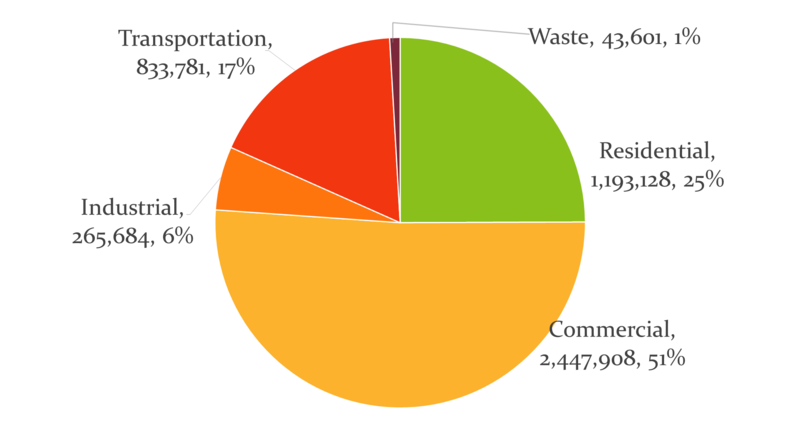 For instance, one of the six areas of focus—diverting waste away from landfills—would only decrease emissions by 1 percent. But, according to local filmmaker and environmental activist Mark Dixon, most of the strategies the city has included in its plan are the right ones, such as planting more trees, promoting alternative sources of energy and reducing food waste. However, he thinks the city should add high-speed rail projects and more emphasis on a smart grid to distribute energy to its plan. What are the shortcomings of the plan? And will the plan work? The plan relies heavily on the city convincing individuals and companies that making changes will be in their own self-interest. Ervin said the city will not be providing any additional funding to meet the new climate goals and instead will rely on changing how existing money is spent. It’s hard to say. Not everything is in the city’s control. One of the largest sources of emissions is from buildings. While the plan calls for updating the building code to address emissions from buildings, the state would need to review and adopt those changes. Also, energy markets can be unpredictable, Ervin said. Though many countries have signed onto the Paris Climate Agreement, it remains to be seen whether countries will meet their targets. Further, some critics such as Dixon say that by focusing only on the city’s emissions, rather than trying to include the broader region, the climate plan falls short. The new Shell ethane cracker plant in Beaver County, for instance, is projected to emit as much greenhouse gases as 50 percent of the entire city of Pittsburgh, according to Ervin. Pittsburgh Mayor Bill Peduto, who helped lead the creation of the first plan as a city council member, said he believes Pittsburgh will have more likelihood of reaching the goals in the plan as global emphasis is put on addressing climate change. "I’m very confident that as the market starts dictating a lot more, that the industries will be changing and making it a lot easier, not just for Pittsburgh, but cities around the world to meet those goals,” Peduto told TV reporters in an interview on Sept. 28. Peduto said on Wednesday that the reality is that fossil fuels will be a transitional energy source for several more decades. But the mistake, he said, would be to only rely on fossil fuels and not plan for a future that will be dominated by clean energy. Why are we learning, at the end of 2017, how much greenhouse gas the city emitted in 2013? There are only a handful of people who have been devoted to measuring the city's emissions and shepherding the creation of the plan. So it has taken the people working on it years to gather the data. The new plan calls for the city to start gathering emissions data every year instead of every five years. The hope is that it won’t take five years next time to know whether the city is on track to meet its emission targets. At the press conference Wednesday, Ervin said there was no timetable set for when 2017 data would be available. The city has already started asking for regular data from the city’s largest buildings and has built partnerships with local utilities to get more frequent data, Ervin said. When will we start to notice a difference? In the next five years, the changes will be pretty modest. But if the plan is fully implemented, in 2023 these early efforts will ramp up. So what could be just a handful of electric buses in the city then, should by 2030 turn into an entirely electric fleet. Part of the reason that there won’t be more dramatic changes right away is to keep costs down. One of the city’s top initiatives in the next five years is to reduce emissions from natural gas leaks, changes that the average person likely wouldn’t notice. “Do the least expensive things that also have the most effect” is one of the guiding principles, Donahue said. How can I give feedback on the plan? The city has incorporated feedback from about 100 meetings and workshops, roughly 300 people and 90 organizations in the past two years. But it’s still seeking feedback. The city has submitted its plan to the Planning Commission and is hoping to get approval on Oct. 10 before sending it to the city council for approval. The city is seeking feedback by email to climate@pittsburghpa.gov. The report itself can be found here: http://apps.pittsburghpa.gov/redtail/images/606_PCAP_3_0_Draft-_9-26-17.pdf. Gore’s organization, The Climate Reality Project (CRP), will host its 36th leadership activist training session from Oct. 17 to 19 at the David L. Lawrence Convention Center.